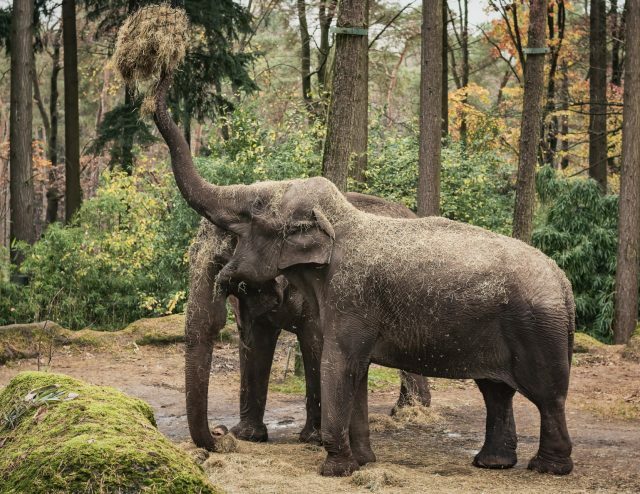 Let’s take a look at a ground-feeding hay net called the Hay Pillow. I’m going to give you my review and what I think are the pros and cons of this slow feeding solution. And then, I’ve got a fun idea/contest for you! Monique Warren, owner of the Hay Pillow, read my popular post on Slow Feeder Design Comparisons and figured I ought to try her solution. So she sent me the standard version (there are a few different sizes/models), to try it out and see what I thought of it. BUT if you lived in a hot, dry climate, or in a cold, snowy climate – basically anything but mud! 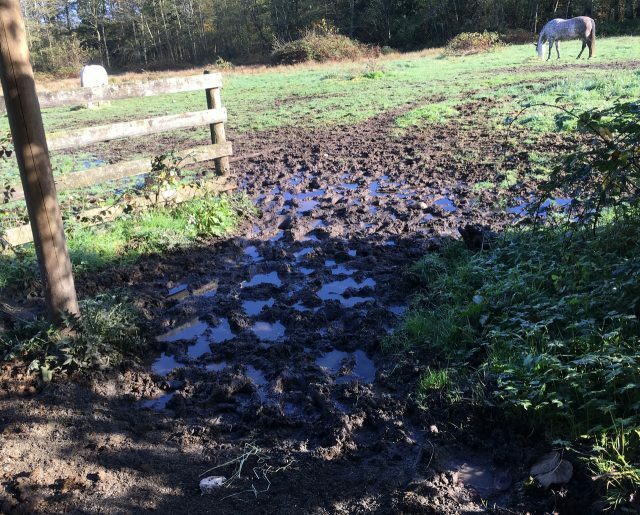 – or if your horse was confined to a dry paddock or stall, I can see this solution working well for you. I’m actually surprised how much hay packed into the pillow, compared to how small it looked! But again, not a good solution for me since I pack my 4’x4′ slow feeders only once every second or third day. If I used Hay Pillows I would have to re-fill them at least 2-3 times a day to keep hay available 24/7 for my herd. Unfortunately, I also cannot test the durability of the Hay Pillow since I only have one – my young herd would then compete for it and it would be subject to uncommonly rough treatment! Which would not be a good test. Since I have 5 horses, I would need to use 6 Hay Pillows to conduct a good test. 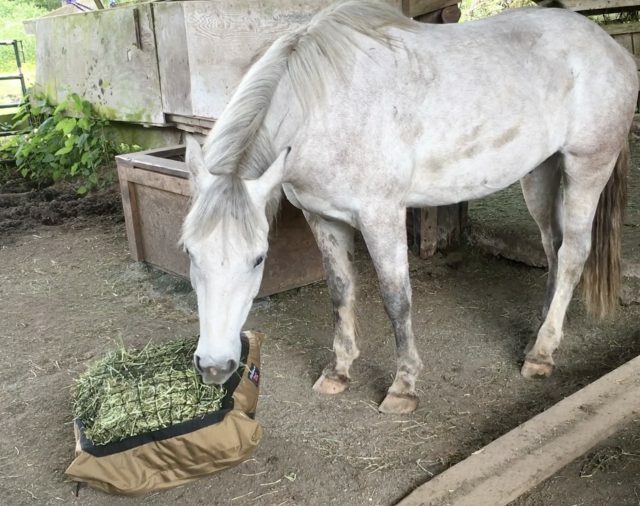 Remember when feeding horses, you always need to put out at least one extra feeding station to avoid generating scarcity/competition/stress among the horses. However, I did speak to a friend of mine, who is using them for her 4 horses near Kamloops, BC (hot and dry in summer, snow in winter) and she loves them. So. 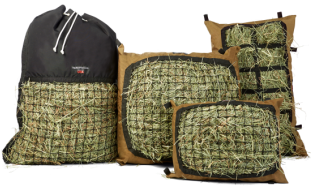 I would like to pass this Hay Pillow on to someone who has just one or two horses in a suitable climate, who would like to test it out and give us feedback! 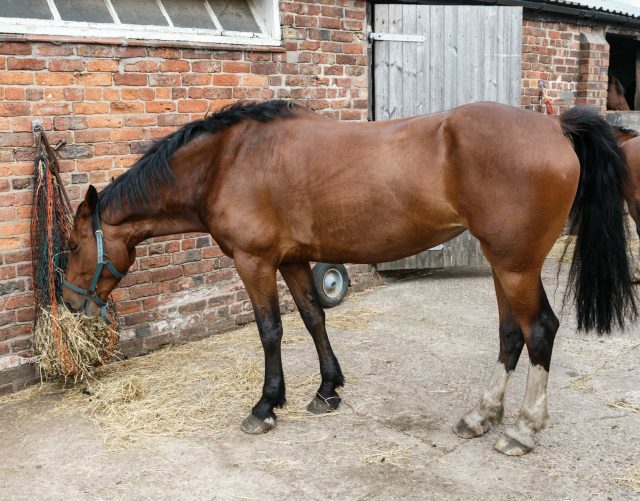 It would be especially good if your horse tends to be a bit rough on hay nets – to see how this holds up in comparison. My Belgian mare has torn through every hay net I’ve tried – she gets mad and just rips them apart with her teeth. She also gets mad at my metal grate slow feeders and stomps on them with her elephant hooves. Jeez I love her fierceness. Reminds me of my daughter! Anyway, leave me some details about why your horse/setup would be a good testing environment – I’ll select the best tester (I’ll do a draw if needed), then I’ll email you directly and ship it out to you. All free of charge. I only used it once for about 15 minutes – as shown in this video – so it’s in practically new condition. Wot fun! ← Best Infographic on Ethical Food Farming! For the past two years I have been trying to master the whole feeding issue. I have finally come to a conclusion. Oh before I forget metal grates are really bad for their teeth. So anyhow….. I have 5 horses that live together and they have 2 boxes with the nibble nets and 1 box with a net I made. Which is similar to the nibble net and I am in the process of making one with clothes line. Each box can fit half a square bale in it and I am working on a few more but this time I am using oval stock tanks. So from constantly trying to figure what works best for them I think variety is good, diff quantity of hay as well as placement of each container is key. This is just what I have observed with my horses. It helps them keep busy, makes them move, rarely any squabbles and lets them eat together if they want or choose to eat alone if they so desire. And I LOVE your trees!!! I would love to try the Hay Pillow. I live in Texas and use the nets most of the time. When it does rain, I do not use nets. I currently use and love the nets made by Natural Horse World. I have also used Hay Chix. I have a herd of 4 donkeys and 1 horse. I just put the bags out on the ground and fill them 3-4 times per day. I use three bags out at a time. The terrain is rocky, weedy and hilly and I just feed the bags near the barn so terrain not too rough up there. Hay Pillow looks pretty durable! So far the natural horse world nets hold up very well. I took a look at the Natural Horse World site (in Australia, right?) and they carry an “extra-tough” hay net with 60 ply polyethylene. However, I wish that ALL hay net makers had some kind of standardized strength/fiber rating so that we could compare. For example, I have used hay nets from both Handy Hay Nets and Nag Bags and my Belgian tore through both. So I’m wondering how those compare to the Natural Horse World net… but there are no standardized specs to compare. Very frustrating. Congratulations Kate! Looks like you’re the next tester for the Hay Pillow! I’ve sent you an email (requesting your mailing address) so if you don’t receive it, check your Junk folder. 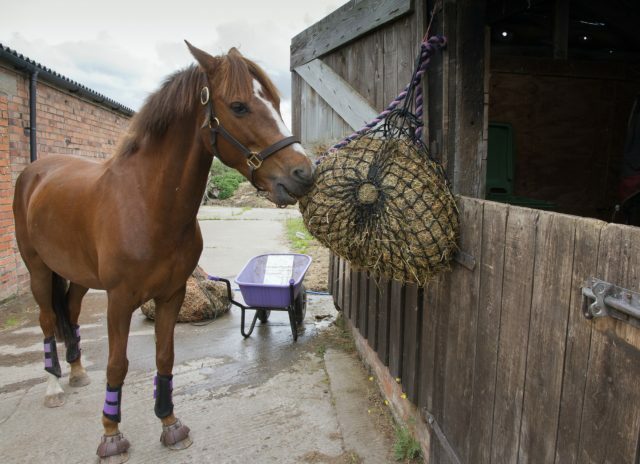 After you’ve had a few months with it, be sure and post back here to let us know how it worked for your horses. Enjoy! got it yesterday! Have had it out with the herd but have not had a chance to observe yets. The workmanship is lovely and it seems strong!! I wish the holes were a bit smaller though.. I need to look through the material that came with it to see if they make a smaller opening. The animals took right to it. I think they will like the shape because it will be easier to stand on than the fluffy round bags that I currently use. Will keep you all posted. thank you!! Yes they do a number of different sized holes – she sent me one of the larger ones because I have drafties. Let us know how it wears and how much they move it around! My concern would be how they work with they aren’t full of feed. Can the horses get at the feed when they are only 1/4 full? Do any of your horses rip through ANY of the hay nets, or Hay Pillows, Lynne? Or do they hold up pretty well? Yes, good point Lynne – we can become focused on finding THE solution, instead of realizing that a MIX of different feeding options can work best. And yes, that makes a lot of sense that the frustration leads to tearing the nets. Unfortunately, to keep Aude from being frustrated I think I’d need to find one with 3″ holes!! My metal grate slow feeders have 2″ openings and she gets so mad with those she stomps on the grates to push them down tighter into the hay – instead of just eating from a new spot! So over time, she breaks the welds. But she’s such a love it’s hard to be too annoyed with her! Just wanted to put this out there metal grates are really harmful for their teeth. Thanks Candice. There’s lots of evidence that BOTH metal grates and hay nets can damage teeth or gums. So best practice is to examine your horse’s teeth regularly to ensure all is okay. Fingers crossed mine have been just fine with both for 3 years now. But I still check every couple of months. Hey there. Yea it’s so frustrating that everything we use has some type of neg effect. So guess all we can do is the best we can. Thanks for mentioning my Tough Nets Jini and Kate. Yes, it’s something to be aware of with buying nets – the ply can vary a lot and that’s why we advertise the ply thickness. 60 ply seems to be pretty hard to destroy, and 48 ply lasts well for the smaller nets which we’ve found after making them for over 9 years now.